I immediately began to worry, convinced I had insufficient Vitamin D consumption. I logged on to my doctor’s office website and based on the numbers from my physical in April, I decided I needed to up the ante. I was heading in the direction of increased risk. 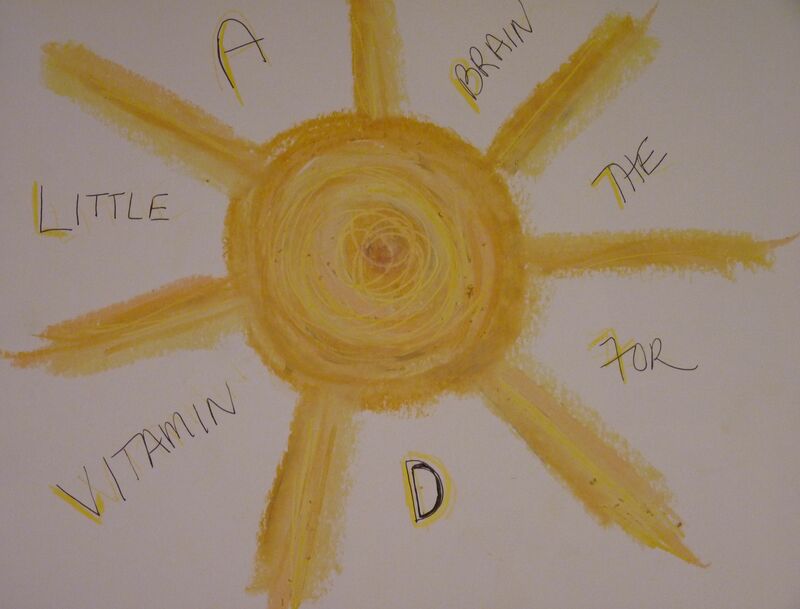 The question was what is the optimal and safe level of Vitamin D intake and how to get it? Online sources give conflicting information. Mercola.com claims that most adults need about 8000 units of Vitamin D a day, The Mayo Clinic, and The National Institutes of Health weighed in with a daily dose of of 600 units, and the Vitamin D Council put the recommended daily allowance at 5000 units, but noted the upper safe limit is 10,000 units. So it seems one is on one’s own when deciding how much Vitamin D to imbibe on a daily basis because taking too much (like 40,000 units per day) can lead to Vitamin D toxicity. Anyway, there was consensus that the best way to get Vitamin D was to expose your bare skin directly to the sun to absorb beneficial UVB rays, while at the same time avoiding UVA rays, the source of wrinkled skin and cell malfunction. To do this you need to aim your body into the sun for a short period of time “when the sun is above an angle of about 50° from the horizon.”. Geez Louise, but I think this is between the hours of 11:00 in the morning and 3:00 in the afternoon in the summer if you live in the northern hemisphere. In addition, skin type definitely needs to be factored in. The lighter the skin the less roasting time required. The Vitamin D Council’s advice is that all you need is enough time for your skin to turn pink. Perhaps you should think that you are cooking a rare burger for lunch. You don’t need to tan or to burn your skin in order to get the vitamin D you need. Exposing your skin for a short time will make all the vitamin D your body can produce in one day. In fact, your body can produce 10,000 to 25,000 IU of vitamin D in just a little under the time it takes for your skin to turn pink. You make the most vitamin D when you expose a large area of your skin, such as your back, rather than a small area such as your face or arms.. In other words if you cover your face and arms with sunscreen, but keep torso exposed for about 15 minutes around noon, you might perfect walking the fine line between not too much sun to get skin cancer, but enough to ward off dementia caused by Vitamin D deficiency. Meanwhile amidst all this Vitamin D research, (and believe me there is alot more out there when you start trying to make sense of the litany of benefits that Vitamin D is supposed to provide), I rechecked my test results. It seems that my Vitamin D was measured in nanograms per milliliter, not nanomoles. Measured in nanograms, Vitamin D levels should fall between 30 to 74 which is the equivalent of 74 to 184 nanomoles per milliliter). With the conversion factored in, I think I may be skirting Vitamin D dementia at the moment, but who knows about the other risk factors that lurk in the new world of the right side of 60.